Notes: Menai Bridge station was located on the Chester & Holyhead Railway (C&HR) which opened in stages between 1 May 1848 and 18 March 1850. The line was a strategic route, engineered by Robert Stephenson, that created a link between London and Dublin via the London & North Western Railway (LNWR) which made an end-on connection with the C&HR at Chester. One of the major engineering features of the C&HR was the Britannia Bridge over the Menai Strait that linked Anglesey to the Welsh mainland. Located half-a-mile west of Menai Bridge station, its completion allowed the last section of the line from Bangor to Llanfair PG to open. On 10 March 1852 the Bangor & Carnarvon Railway (B&CR) opened the first section of its line from a junction at Menai Bridge to Port Dinorwic. From 1 July 1852 it opened through to Caernarfon. 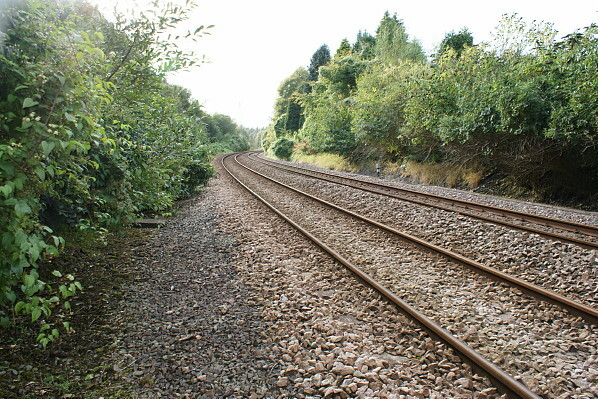 The B&CR was single-track and connected directly only onto the up line (Chester direction) of the C&HR at Menai Bridge Junction. This meant that B&CR trains travelling towards Caernarfon had to run along the main line towards Holyhead for 420yd then make a reverse movement onto the Caernarfon line before they could proceed. with the B&CR at Menai Bridge. This was the location where the Menai Suspension bridge, engineered by Thomas Telford, and forming part of the London and Holyhead turnpike road had opened on 30 January 1826. Menai Bridge station opened on 1 October 1858. The line at this location was built on a ledge facing north where an embankment sloped steeply down to the Menai Strait, and on the south side a cutting had been formed. To fit the station into the location the main building was south of the line. The booking office was on the ground floor, and steps led up to the first floor which was adjacent to the up (Chester-bound) C&HR platform. It was a dignified three-storey mildly Tudor H-plan building constructed in dressed stone. The window openings were rectangular, most with hood-moulds above them and stone quoins, though on the frontage at ground level were canted bays, each with a parapet, either side of the modest entrance. On the platform elevation, at first-floor level, there was a flat awning above a recessed waiting shelter, topped by an octagonal chimney with curved wing supports above a clock space. The steeply pitched roof was slated, and at both ends were low, but massive, quadruple chimney stacks. 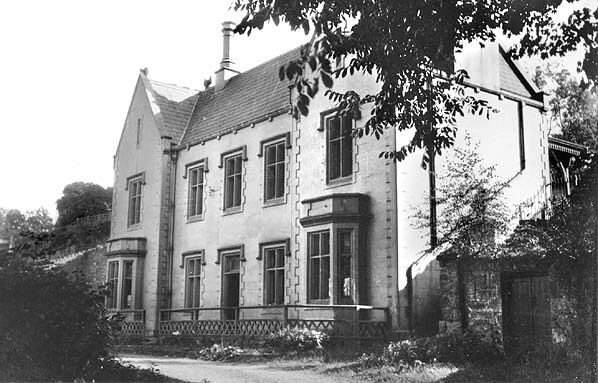 Beneath the gable ends, facing the frontage and platform elevations, the second storey had blind windows. Behind the building, and for the length of the station, the line was supported by a stone wall that extended in height to beyond the first floor of the station building. Biddle (1973) notes that many stations on the Chester – Holyhead line were the work of the architect Francis Thompson. Menai Bridge was opened after Thompson’s association with the line but had some characteristics of his designs. Biddle also notes that Menai Bridge’s main building might originally have been a private house. narrow as it was sandwiched between both lines, very close to the fork of the junction, which was remodelled so that trains from the B&CR did not have to carry out any reverse moves. There was no space for substantial buildings so it was provided with a simple timber shelter towards the eastern end. The down B&CR platform was provided with a larger brick shelter located at the middle of the platform. On the south side of the line, east of the station, a signal box controlled the junction. To the east, on the north side of the line, was a goods yard with two sidings and a goods shed. 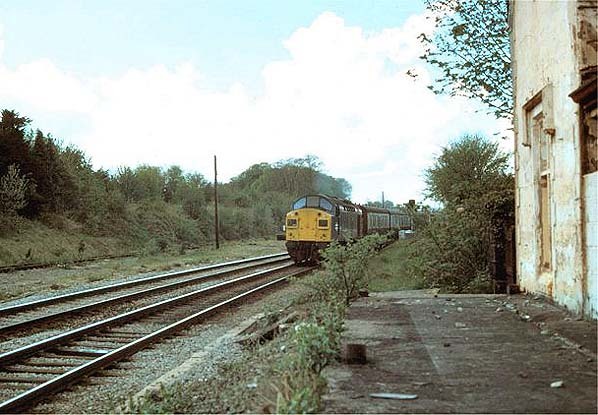 Further sidings were provided to the west of the station between the C&HR and the B&CR lines. At the time of opening Menai Bridge was served by trains running between Chester and Holyhead - and shorter workings along that line - and by trains running between Bangor and Caernarfon. From the start there had been a close relationship between the C&HR and the LNWR, and since 1854 the latter had been operating the train services. In the same year an Act authorised the transfer of the B&CR line to the C&HR and it, too, was operated by the LNWR. The LNWR purchased the Chester and Holyhead line on 1 January 1859 but the C&HR company was not officially wound up until 21 July 1879. On the 17 June 1865 an accident occurred at Menai Bridge. A train from Caernarfon on route to Bangor, consisting of a tank engine a van and four coaches, arrived at Menai Bridge at 8.48pm. 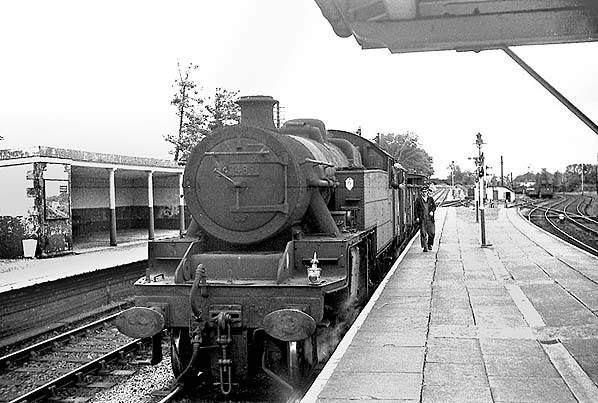 The signal at the east end of the station was set against it as a Chester to Holyhead train, hauled by a tender engine and consisting of eleven coaches and a brake van, was approaching. After standing at the platform for one minute the guard of the Caernarfon to Bangor train asked a porter if he was ready for the train to depart. The porter told the guard that he was, and the guard blew his whistle. The driver started the train immediately, even though the signal was against him. Seeing what was happening the signalman put the down main line signal to danger to stop the Holyhead train but it was too late as its engine had passed the signal. The Holyhead train was slowing to stop at Menai Bridge but it ran head-on into the Caernarfon train at the point where the Caernarfon line crossed the up main line. Nobody was killed but 26 people were injured. It was discovered that the driver of the Caernarvon – Bangor train had two boys from Bangor on the footplate with him, which was expressly forbidden. He was dismissed from the service of the LNWR and blamed for the accident. However the Board of Trade Inspector, Captain H W Tyler CE, in his report was critical of the signalling arrangements at Menai Bridge. He considered that they were difficult to see and that extra signals should be installed on the B&CR line. Although the junction arrangement that required trains travelling towards Caernarfon to make a reverse move was not responsible for the accident, Captain Tyler made mention of it in his report and gave recommendations in relation to it. The junction was altered to a more conventional layout. interchange point for passengers wanting to travel between Anglesey and points along the Afon Wen line. The December 1895 timetable showed Menai Bridge having 13 up and 11 down trains on Monday-to-Friday, as shown in the table below. There was an extra train on Thursdays and Saturdays and two in each direction on Sundays. Passenger services had increased still further by July 1922 when there were 23 up and 19 down trains on Monday-to-Saturday but only one in each direction on Sundays. On 1 January 1923 Menai Bridge became part of the London Midland & Scottish Railway (LMS). In the summer of 1932 there were 18 trains in each direction on Monday-to-Friday from Menai Bridge. There were numerous extra services on Saturdays and a handful on Sundays. Locally passengers could travel to Amlwch, Bangor, Caernarfon, Holyhead and Llandudno. They also had trains to Afon Wen, Chester, Liverpool, London, Manchester and Birmingham. The 1930s had also seen growth in summer holiday trains. With the outbreak of the Second World War on 3 September 1939 emergency timetables were introduced, and services were reduced dramatically. From the summer of 1947 holiday specials began to run once again, and the Afon Wen line saw major growth to its traffic. This was because a Butlins camp had opened at Penychain, west of Afon Wen. The Butlins camp was a popular destination, and the line became even busier during the 1950s. 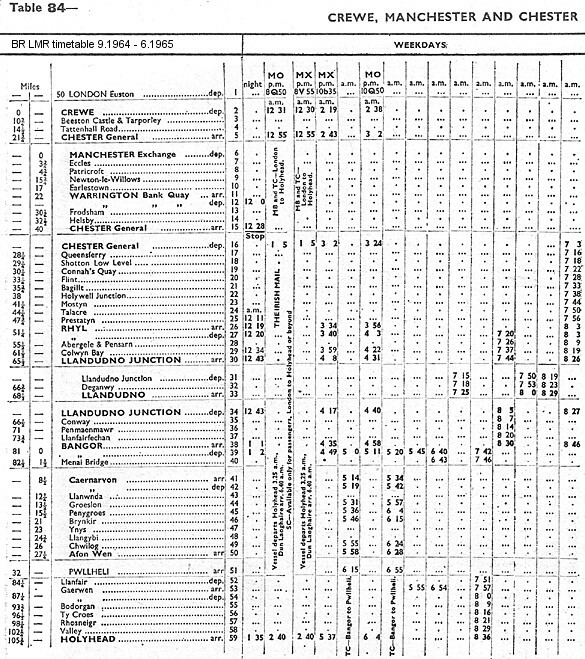 The summer timetable for 1957 showed Menai Bridge having 22 up and 19 down trains on Monday-to-Friday, as shown in the table below. On Saturdays there were many additional services. Menai Bridge station became part of the London Midland Region of British Railways on nationalisation in January 1948, and in the late 1950s maroon ‘totem’ signage was installed. The station remained busy into the early 1960s; however the Reshaping of British Railways report of 1963 (the ‘Beeching’ Report) recommended the closure of the line between Caernarfon and Afon Wen and the closure of many intermediate stations on the Chester and Holyhead line, including Menai Bridge. 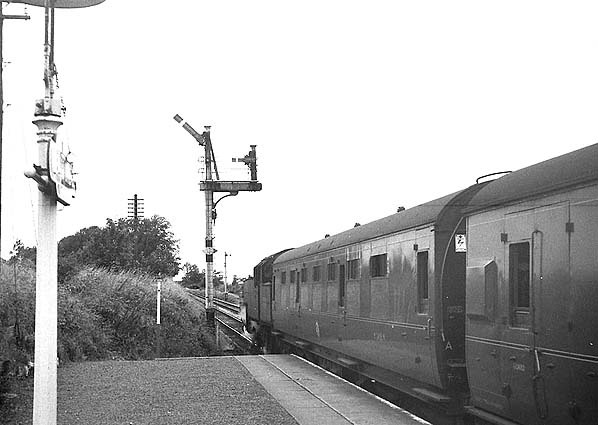 The formal proposal to close Menai Bridge station, and a number of others on this route, was published on 15 October 1964, and on 19 November 1965 Thomas Fraser, the Minister of Transport, gave consent. Closure of the line between Caernarfon and Afon Wen had received consent from Ernest Marples, Minister of Transport, on 11 September 1964, and this took place three months later on 5 December; the Bangor and Amlwch passenger service was withdrawn on the same day. A shuttle service, calling at Menai Bridge, continued between Bangor and Caernarfon, supplemented by summer holiday trains from such places as Liverpool and Manchester. 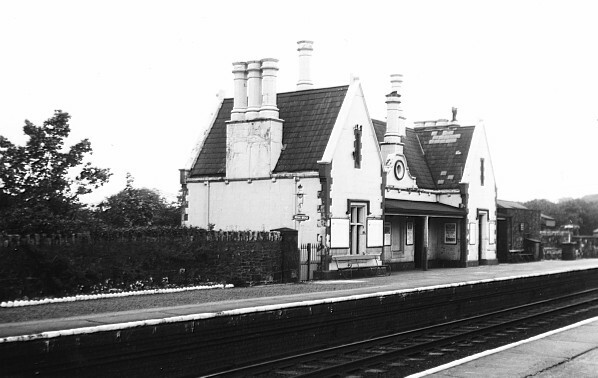 With the loss of many of its services Menai Bridge station was closed to passengers on 14 February 1966. Later that year the line to Caernarfon was singled, which resulted in the former up B&CR platform losing its track. 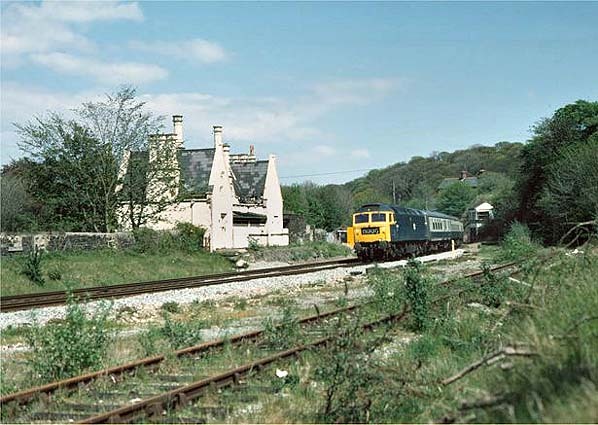 On 4 March 1968 Menai Bridge was closed to goods services. The station had a moment of glory on 1 July 1969 when at 3.10am the Royal Train, carrying Prince Charles to his Investiture as Prince of Wales at Caernarfon, pulled into the station sidings. It remained at Menai Bridge until just after midday when it set off towards Caernarfon. On 4 August 1969 the Caernarfon line closed to goods, and to passengers on 5 January 1970. It was brought back into use for container traffic from 15 June 1970. The reason for this was the disastrous fire that swept through the Britannia Bridge during the night of 23 May 1970. Two young boys had carelessly caused a fire that left Anglesey cut off from the mainland as far as rail services were concerned. The bridge was repaired and reopened on 30 January 1972. After that date the Caernarfon line closed permanently and was lifted. The platforms at Menai Bridge were demolished, but the building remained in situ until the 1980s when it was demolished, and a children’s nursery was later built on its site. A small industrial estate was built on the station approach. The goods yard was also developed with industrial units, but by 2010 they had become derelict. They were taken over in 2011 for use by local artists working on a variety of projects. The station subway remained extant in September 2012. 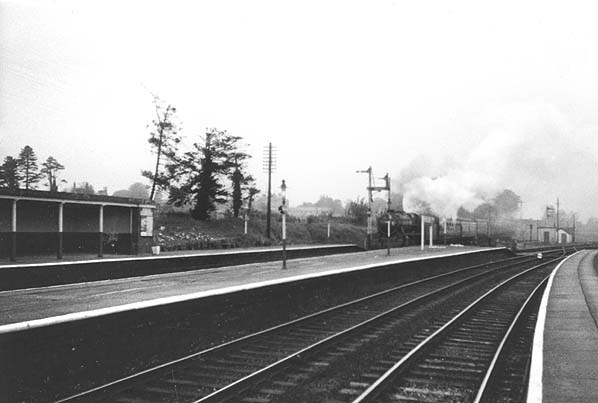 Menai Bridge station in 1936. The main entrance and booking office were at ground level and the platforms were level with the first floor of the building. 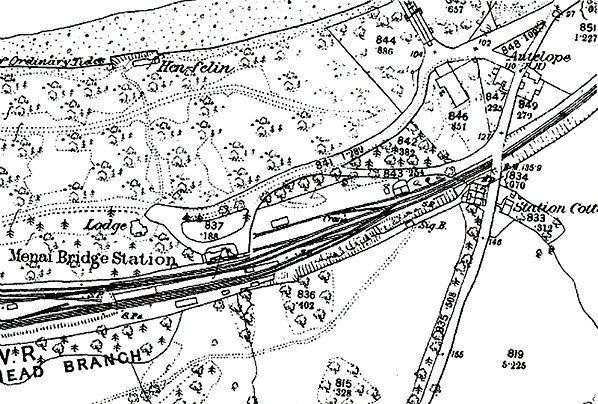 Menai Bridge station and goods yard in 1899. Menai Bridge station looking east from the Holyhead line Chester direction platform in August 1953. 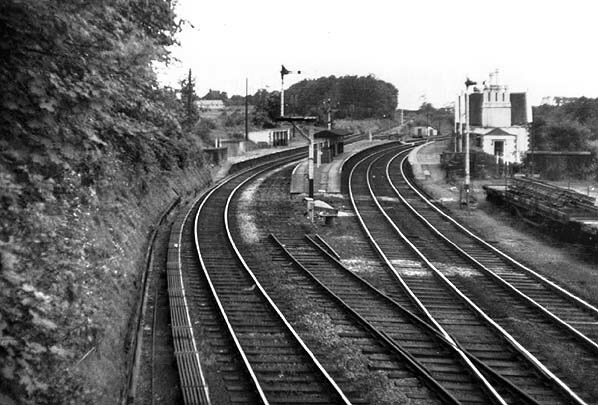 Looking west from the Chester direction platform at Menai Bridge station in the early 1960s. A train can be seen approaching the station from the Afon Wen line. 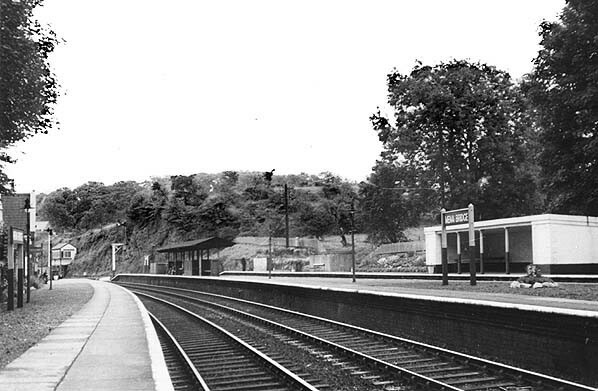 The main station building at Menai Bridge looking east from the island platform in July 1963. A train departs from Menai Bridge for Penychain in August 1964. Caernarfon and it had been singled. 47456 passes Menai Bridge on 14 May 1977 with a train for Holyhead. As well as the almost intact station building, the derelict signal box is also still present. The overgrown track in the foreground is the remains of the Caernarfon branch - still connected to the main line but secured out of use. This track ended a few yards further on, at the point where the connection to the marshalling yard diverged. Looking west along the Holyhead line Chester platform at Menai Bridge station in May 1977.
seen on 28 September 2012. The site of Menai Bridge station looking west on 28 September 2012.